The MineTan Bronze Babe Personal Spray Tan Kit allows you to achieve a salon-quality spray tan in the comfort of your own home. Suitable for beginners or pros, the easy-to-use kit delivers professional-looking results in minutes with little to no overspray. The Set Contains: Tan.Handy Spray Tan Gun A lightweight, compact spray tan gun with eight levels of spray control, allowing you to choose your shade of tan from a subtle glow to full-on, back-from-Barbados bronze. 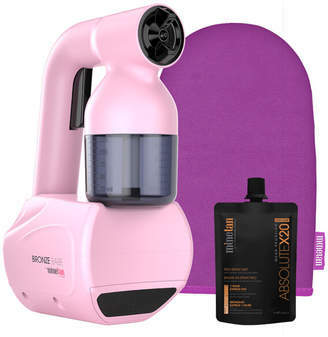 The ultra-fine mist delivers an even, flawless colour with no streaks or patches and the optional heat setting makes drying quicker and easier. Use the self-tanner for touch-ups on the arms, legs and face, or to achieve an all-over glow. Little to no overspray for zero mess. Lighter than most hairdryers. Detachable, extra-long power cord. Easy one-touch control. Quick-change filter. Refillable spray tan mist cup. Easy to clean. Absolute Pro Spray Tan Mist (50ml) A one hour express tan with extreme ultra-dark skin finish to suit all skin types and tones. Formulated with a combination of X20 quad bronzing melanin activating intensifiers and naturally-derived tan actives, the extreme tan produces a deeper, darker and faster tan in as little as one hour. Infused with powerful antioxidants and hydrating oils for maximum moisture. No orange tones or fake tan smell. By choosing when you shower, your tan continues to develop into an ultra-dark skin finish. Bronze on Applicator Mitt Ideal for use with self-tan foams and lotions, this deluxe velvety self-tan mitt allows you to achieve a flawless, streak-free finish while acting as a barrier to protect your hands from any unwanted staining.